He was born on the 26th of July, 1952 in Aghdam city. Asif finished secondary school # 1 in Aghdam in 1969. He wanted to become a lawyer. The fact the he had a huge family forced to look for a job from a very young age. So, he started working as an ordinary worker at Aghdam Machine – tool Construction Factory. Asif had his own understanding of life and he greatly treasured the values such as; Honor, Dignity, Chaste, and Justice. Maybe it was the reason why he did not have a smooth pass in life. He was supposed to do military service on the 31st of October, 1971 but he ended up in the jail instead. He met with his friends and family on the 30th of October as a farewell gathering and they decided to go to the cinema. But there was a fight and Asif was sentenced to 2 years of prison while protecting the justice. He served 9 months of his sentence in jail and the rest was substituted with the forced labor. He worked as a driver while doing the forced labor. He had an accident while doing his work and hit the ambulance car. Therefore he was sentenced again but this time the duration of the sentence was 3 years and 8 months. After he was discharged from the jail, he returned back to Aghdam and started working as a driver. Armenian gangsters started attacking Azerbaijani lands in 1988 and therefore groups of self defense units were established within the regions such as; Abdal – Gulabli, Khidirli, Amirallar, Sirkhavand, Baghbanlar and Ahmadavar. Asif himself established a self defense battalion in Aghdam in 1990 and took a very active part in protecting our lands from the invaders. And on the 15th of November, 1991, the first National Voluntary battalion was established by the government. He bravely fought for the sake of Khramort village on the 31st of December, 1991 and did nt even spare his own life in rotecting innconet children and women in Khojali tragedy. He helped them to escape Khojali and find a shelter in a safer place. Asif Maharramov was appointed as a commander of the Unit of Mine detectors # 859 on the 7th of March, 1992. It was thanks to his great support and efforts that Aranzamin, Pirjamal, and Dahraz villages were released from the enemy occupation on the 10th of March, 1992. He went to support other self defense battalions in Fizuli region and destroyed a lot of enemy manpower and military equipment on the 20th of March, 1992. But the brave commander was severely wounded in the battle for the sake of Nakhchivanik village. After being treated for a while, he decided to return to the front again. He took an active part in the battle for Shelli village on the 22nd of February, 1993 but by the 27th of October of the same year, his health had already gotten worse. Therefore he was forced to turn over his military unit and to continue with his treatment at the hospital. Asif Maharramov died on the 1st of July, 1994 while he was on his way to Yalta for the treatment. He was married and survived by a daughter. 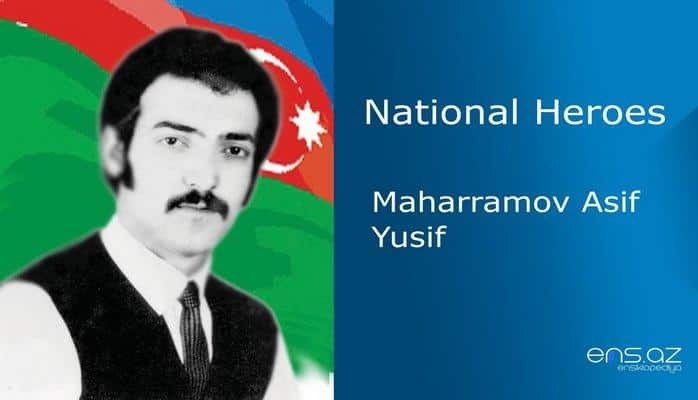 Maharramov Asif Yusif was awarded the title of the “National Hero of Azerbaijan” by the decree # 350 of the president of the republic of Azerbaijan on the 7th of December, 1992. He was also awarded the medal of “General Mahammad Asadov”. He was buried in the second Alley of Martyrs in Baki city. There is a street after the hero in Baki city as well.